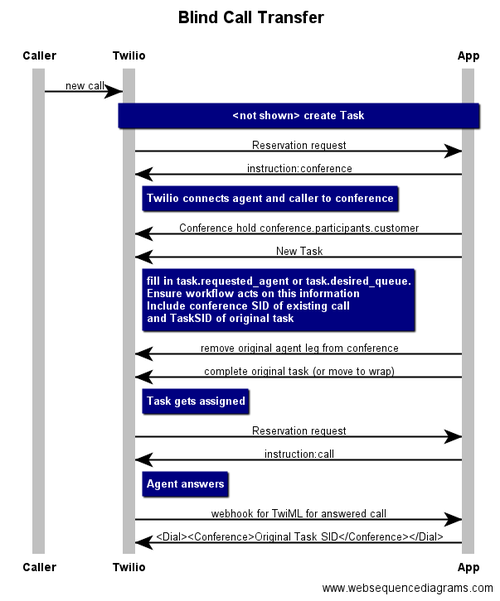 Twilio recommends that all calls between customer and agent (both inbound to agent and outbound from agent) be connected via a Twilio <Conference> hub. Note that the name Conference can be misleading - think of Conference as the network media resource which allows your calls to be transferred, or do things like monitor, whisper, barge. All Twilio contact center voice features are designed with Conference at the middle of the call topology. By adopting conference, as well as getting access to the features described below, you will also ensure your call topology is built in the right way to inherit future Twilio roadmap items. Note that while there are multiple ways to build these sorts of call flows, the recommendations here focus on using TaskRouter as part of each use case, in order to make sure that TaskRouter has full visibility of agent utilization, to ensure reporting/dashboard accuracy. Connect agent into conference. The conference will be named by the TaskSID. Move the caller from the queue and into the conference (note that this flow is optimized to ensure the media is routed locally for global deployments using Twilio Global Low Latency (GLL)). To invoke this function, simply issue a 'conference' instruction to the reservation request, either through the TaskRouter JS SDK or as a response to the assignment callback. More details on TaskRouter conference instruction are available here. Putting a call on hold is easy provided you have already set the call up via a conference bridge as described above. To put the caller on hold, simply POST to the Participants Resource. If you are using TaskRouter's conference instruction, all the SIDs you need will be within the Task Attributes. The HoldUrl should provide the instructions for what hold music/announcement you want to play while the caller is on hold. In the blind call transfer scenario, it is not important for the addition of the new participant to be completed before the first agent call SID is removed. The conference and caller leg will stay up even if no one else is on the conference. However, if you are investing in accurate reporting of your contact center deployment, you will probably want to use TaskRouter to deliver this blind transfer, in order to ensure accuracy of agent statistics. If you are using TaskRouter's conference instruction, the name of the conference you need to join will be the Task SID. Note: Currently upgrading a supervisor monitor call to a whisper call requires dropping the monitor call and setting up a new whisper call. Please refer to the Whisper documentation for the current best practices on moving a whispered call to a barge in.